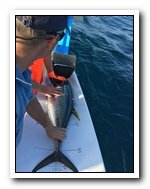 This tuna tagging program initiated in February 2017 will run for 3 years with the aim of improving our knowledge of tuna movement, growth rate and numbers. 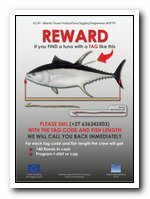 The International Commission for the Conservation of the Atlantic Tuna (ICCAT) has launched a tuna tagging program in South Africa to tag a total of 6500 Yellow fin, Bigeye and Skipjack tuna in a joint program with Capricorn Marine Environmental (CapMarine) and the Department of Agriculture, Forestry and Fisheries (DAFF). ICCAT is an inter-governmental fishery organization responsible for the conservation of tunas and tuna-like species in the Atlantic Ocean and its adjacent seas. ICCAT compiles fishery statistics and supports the management of tuna stocks in the Atlantic Ocean on behalf of its members (countries), coordinates fisheries research and conducts stock assessments. In June 2016 ICCAT initiated the Atlantic Ocean Tropical Tuna Tagging Program (AOTTP) funded by its members and the European Union. The aim is to tag a total of 120,000 tunas in the Atlantic Ocean in the next three years including 6,500 in South African waters. 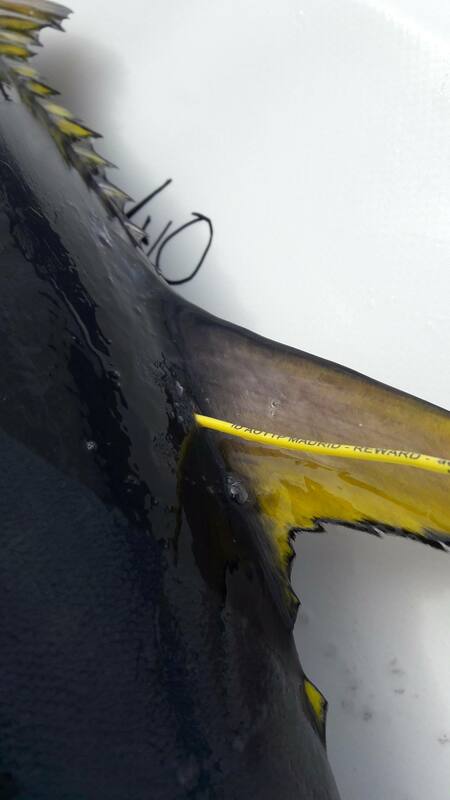 During the next six months a tagging team working closely with DAFF will be deployed by CapMarine in Cape Town to tag the three tuna species with spaghetti and electronic tags. The team will be monitoring tuna landings at the main ports, fish landing facilities, processing plants as well as commercial and recreational tuna boats to collect all the information on tagged tunas are caught and recovered. Any persons who may recover a tagged tuna, please could they text, WhatsApp, or call the number +27636342503. After providing information about the code number of the tag, the length and some additional biological data the tag finders will receive T-shirts or caps of the AOTTP and also a small cash reward of R140 (see poster). The AOTTP results aim to improve our understanding of tuna movements, their growth rates and the abundance of the main commercial species. This important information will then feed into the management of the stocks of tropical tunas in the Atlantic Ocean. 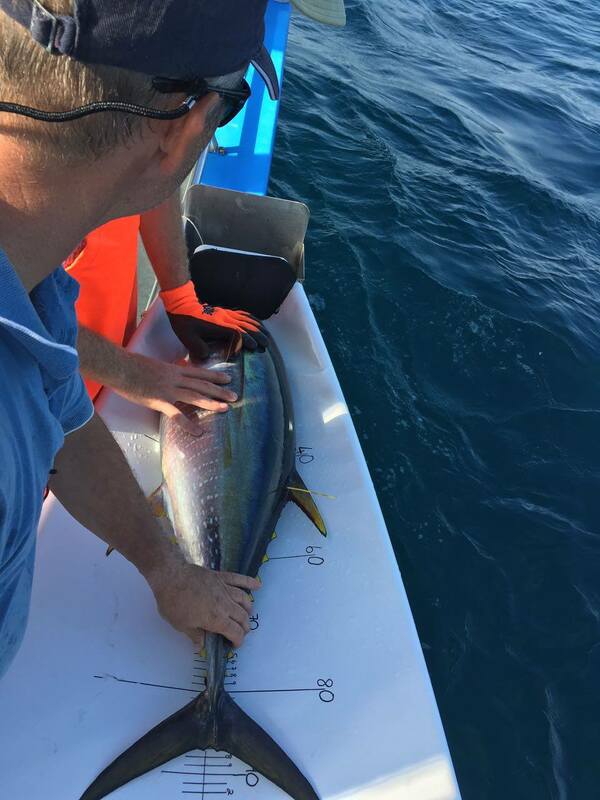 From February - April up to 3000 yellowfin and skipjack tuna will be tagged with yellow or red spaghetti tags that need to be recovered to gain valuable insight into the movement, growth rates and population sizes of tuna within our Exclusive Economic Zone. If anyone catches a tagged tuna during the program, we ask to please get hold of us by sending an SMS to +27636342503, after which we will call you back as soon as possible. To fill you in on where we are now, our tagging efforts were severely hampered by bad weather and a distinct lack of tuna for the time of year. This meant we were nowhere close to the (very optimistic) target of tagging 3000 tuna in 3 months, and only managed to tag little over 200 tuna. Tagging operations have now ceased for the time being, so that is what we have to work with until next season. Understandably this compromises the program somewhat, but more importantly there is now more emphasis on each and every tag out there. 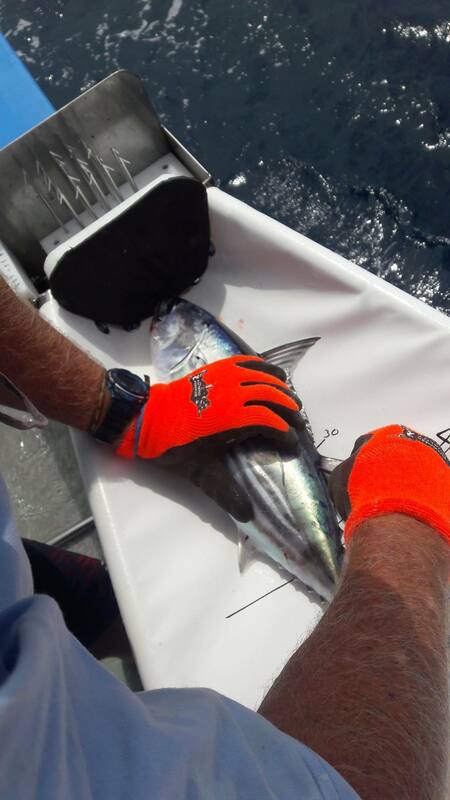 Therefore, for us it is utterly important that as many people as possible are fishing for tuna, are aware of the program keeping their eyes open for tags and will report the tags when landed. With this is mind please could I ask you to send out this information to your mailing list to keep the tuna tagging program on everyone's mind when going out fishing? This would be a really big help to us, and would be greatly appreciated. If you have any questions/concerns or information from your side please feel free to get hold of me. EPDSAA encourages all anglers to help protect our endangered fish species by honouring the Marine Protected Areas of our country.